Who says good style can't be comfortable? We’re all for guys building a wardrobe full of classic, “never going out of style” pieces here at SG HQ, but sometimes a trend simply refused to be ignored. Case in point: the jogger pant. A year ago, only a few fashion-forward brands offered the pant with an elasticized ankle (and for way too much money, at that). Now, finding a pair is as easy – and inexpensive – as hitting up your local mall’s racks. 1) They’re basically dressed-up sweatpants, meaning you can wear your formerly “only at home” comfy pants out of the house, and no one will judge you. 2) They go with pretty much everything that’s already in your closet. The style is so mainstream that at this point you can find joggers offered in nearly any material you can think of – denim, khaki, terry cloth, etc. If you don’t want to wear real pants, it’s time you jump on the jogger pant bandwagon. SG Says: Consider this Joggers 101. 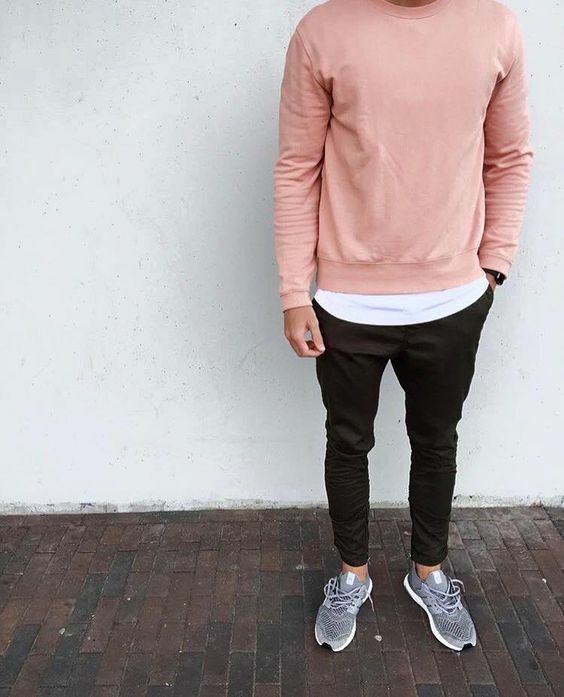 If you’re wondering how to wear jogger pants, start here. 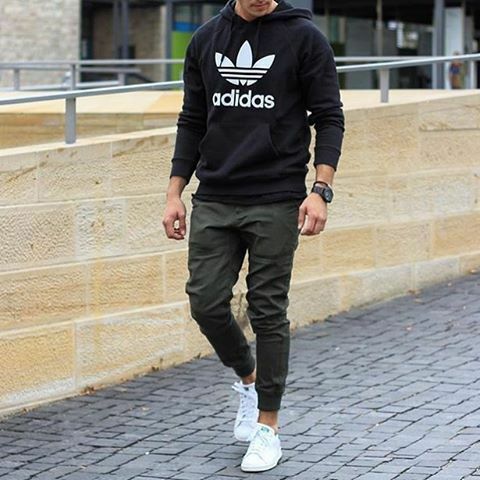 Clean white sneakers, dark colors, minimal accessories, and a casual-but-well-fitting hoodie. If the idea of wearing tapered athleisure pants already has you outside your comfort zone, an outfit like this will feel stylish, not scary. SG Says: Apart from the cigarette, we’re very into this whole look. A monochromatic palette? Check. Breezy yet sophisticated slip-ons? Check. Statement jacket casually slung over shoulder? Checkmate. 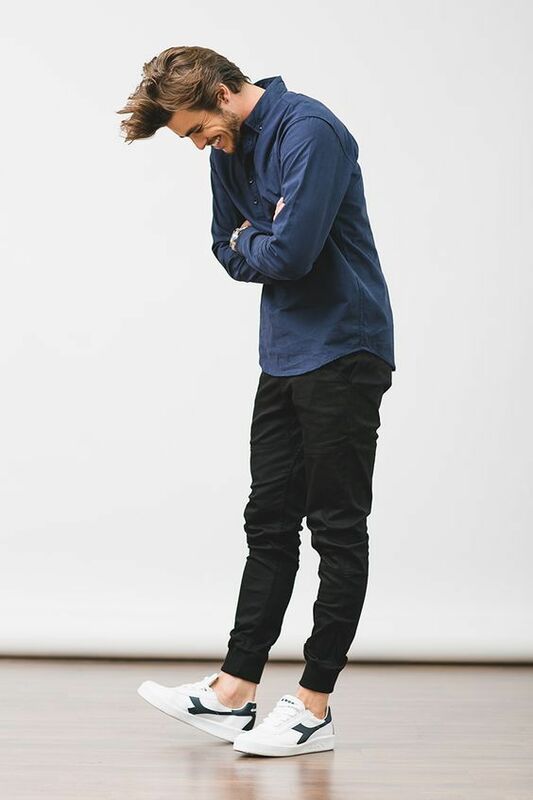 SG Says: Olive chinos and a light sneaker, worn in two different seasons. 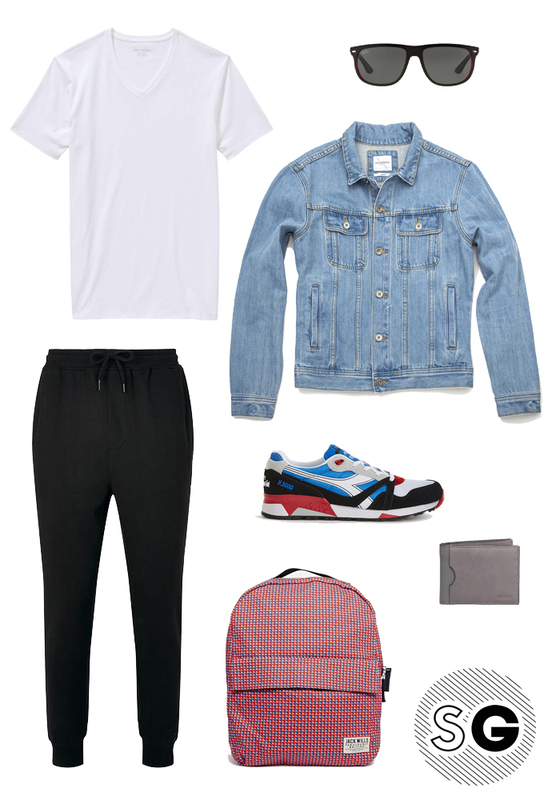 On the left, the t-shirt and flash of ankle show you how to wear jogger pants in warm weather. On the right, thick socks and a sweater under a denim jacket let you know these pants are not reserved for spring and summer. SG Says: Do not sleep on this brown and millennial pink pairing. Broken up by a clean white tee and capped off with oh-so-casually unlaced sneaks, this outfit looks fresh and modern…yet fully grown-up. SG Says: If you were wondering how to break out of the mold when it comes to jogger pants, here’s how. Yes, you can wear bright colors, and yes, you can even wear camo. So long as the fit stays slim and the rest of your outfit looks put together, not sloppy. SG Says: You can even wear jogger pants with a button-down shirt. Don’t tuck the shirt in (hopefully that’s obvious, but you never know), and keep the color palette neutral if you’re feeling nervous. SG Says: Skip the socks (or go no-show) and show off some ankle in this ready-for-class look. SG Says: If you’re lucky enough to have a lax dress code at work, jogger pants can be a great alternative to slacks. Treat them like regular pants with a tee (with a slight tuck? your call) and high-tops with cool socks. SG Says: When you wake up on Saturday, you want to put sweatpants on. Resist. Jogger pants are just as easy, but look twice as nice. SG Says: The tapered silhouette of jogger pants are ideal for showing off your favorite sneakers. Throw on a crisp white tee with a light denim jacket, and pull it all together with pops of color in your accessories. Oh yes, a pair of pants with an elastic waistband can still show off your personal style enough to become a go-to errand outfit. Rocking this look, you can breeze through your to-do list and a coffee date all while looking put together. Caveat: save this look for weekend and off-duty outings since it is the epitome of casual cool. Like this article? Check out more ways to work your wardrobe here and here and here!